Christopher John Dodd(1944- ) is an American lawyer and politician. He currently serves as the senior senator from Connecticut since 1981, and has announced that he will retire and not run in 2010. Prior to his senatorial career, he was a member of the House of Representatives from 1975 until his election into the Senate. His father, Thomas Joseph Dodd, was a U.S. Senator representing the same state from 1959 to 1971. He launched a bid for the Democratic nomination to presidency in the 2008 United States presidential election, but withdrew after poor showing in the Iowa Caucus. 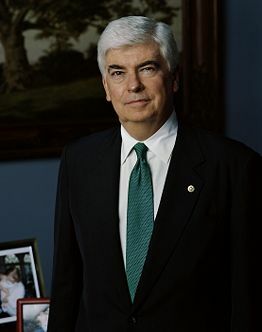 Christopher Dodd was born in Willimantic, Connecticut on May 27, 1944 in an politically eminent Irish-American family. His father, Thomas Joseph Dodd, was a prosecutor in the Nuremberg Trials following World War II and later served in the U.S. Senate. He attended the Georgetown Preparatory School in Maryland and graduated from Providence College, Rhode Island in 1966. Then he served in the Peace Corps in Dominican Republic until 1968. He studied law at University of Louisville in Kentucky and graduated in 1972, after which he entered private practice in Connecticut. He joined the U.S. Army in 1969, serving until 1975. Dodd was elected into the House of Representatives in 1974 and served from 1975 to 1981, when he commenced his service in the U.S. Senate. In the Senate, Dodd's major accomplishment include the passage of Family and Medical Leave Act of 1993, which allows workers to take absence during the birth or adoption of children or in times of illness in the family. He also spearheaded legislations to tighten regulations on large corporations and to reform the education system. Dodd announced his entrance to the 2008 presidential election in January, 2007. During his campaign, he focused on restoring the rights guaranteed by the U.S. Constitution, particularly in his opposition to George W. Bush's abridgment of civil liberties. In the Iowa Caucus he trailed the front runners such as Hillary Clinton and Barack Obama, after which he withdrew from the race. ↑ 3.0 3.1 Associated Press. Dodd drops his presidential bid, MSNBC, Jan. 3, 2008. ↑ Dodd, Christopher (October 22, 2007). My Oath of Office. Huffington Post. Retrieved on January 21, 2008. This page was last modified 02:26, 7 February 2010.